Shaun Blezard, the man behind Clutter, is an old friend of mine in the netlabel scene... his label "earth monkey productions", now tragically on hiatus, was the catalyst that got me into ambient music and introduced me to Cousin Silas and a number of other great musicians. He works between the fields of electroacoustic improvisation, ambient electronics and music concrete, adding touches of anything from dub, jazz and post rock to his eclectic mix of influences. 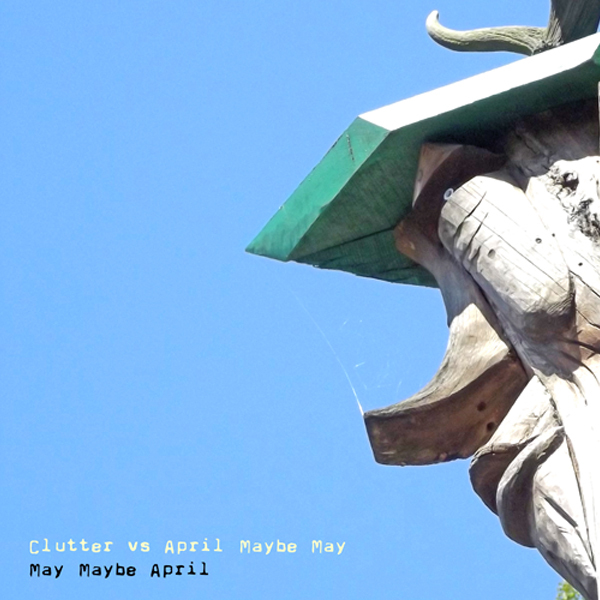 I was, as you can imagine, really excited when he asked me to voice my thoughts on his latest EP "May Maybe April"... a collaborative effort with April Maybe May - Rosie Hillman and Matt Kassell are the songwriters, musicians, voices and producers of April Maybe May, the 'quietest band in the world'. The first three tracks - "one more dress", "dreams of a kiss curl" and "my unspoken vows" - each have a rhythmic, almost hypnotic feel to them... the sounds whirl and dance repeatedly in the ears like sonic Dervishes... round and round in such an infectious manner that it's hard not to be sucked in. This is, in part, due to jazzy bass backbone and the looping samples that build the rhythm. Additional layers of sound include the seductive song of a siren... her vocals almost tangible... nearly in reach. The fourth track - "choices run away" - is ironically, considering its title, more restrained... it has the most delightful drifting ambience about it. The languid feel adds an almost dream-like quality to the track... which is a fitting end to this lovely EP. I would heartily recommend this EP to anyone who appreciates ambient soundscapes. I thoroughly enjoyed it. Take the time to find out by having a wee listen below.